I love doughnuts – as do many of you, I believe – but the idea of frying them... Not so much. I’m not a fried food kind of cook – I love eating it, not making it. That is why I was quite taken by this recipe: the doughnuts are baked instead of fried and they turned out beautiful, very tender, absolutely delicious. Start by making the dough: combine flour, sugar, yeast and lemon zest in the bowl of an electric mixer fitted with a dough hook, mix to combine. Whisk together milk, buttermilk, eggs and the melted butter and, with motor running, add to flour mixture, then mix on medium speed until dough is smooth and elastic (4-5 minutes). Shape into a ball, place in a lightly oiled bowl, cover with plastic wrap and stand in a warm place until doubled in size (1-1½ hours). Meanwhile, for lemon ricotta filling, process ingredients in a food processor until smooth (1-2 minutes), transfer to a bowl, cover with plastic wrap and refrigerate for at least 1 hour (otherwise it will be too fluid). Knock back dough, turn onto a lightly floured surface and roll to 5mm thick. Cut 48 rounds with a 7.5cm-diameter cutter (reroll scraps if necessary**). Place a heaped teaspoon of lemon ricotta filling in centre of 24 rounds. Brush edges with milk, cover with the remaining rounds, press to seal edges well. Trim with a 7cm-diameter cutter. Transfer to a large baking sheet, lined with baking paper, cover and stand in a warm place until risen (1-1½ hours), then bake until lightly golden (10-12 minutes). Meanwhile, melt the butter and set aside. Combine sugar and lemon zest in a bowl. Dip hot doughnuts immediately in the melted butter, toss in lemon sugar and serve hot. They look so delicious! It's a real pity that it os so difficult to buy ricotta in the area where I live. Definitely a recipe worth saving. We were both going with a citrus theme this week I see! I would love to try this baked doughnuts. What would you suggest for alternative instead of using ricotta? Would cream cheese be ok? These look amazing, I don't think I'd miss the frying at all! Wow these look amazing. I love doughnuts but hate the bother of frying. These look fantastic. Oh, oh! How I love lemon! These look like little pillows of awesomeness. Sweet, tart, and better than fried! So yummy. Velvet, check the link I placed on the recipe - homemade ricotta, it's so easy to make and tastes delicious. I haven't purchased ricotta in years! Thank you so much, Patricia! I'll surely make it as soon as I get a muslin. I think it's going to be fun. They look so fluffy! I can imagine how delicious they must be! I've been wanting to try baked donuts lately-thanks for a great recipe! 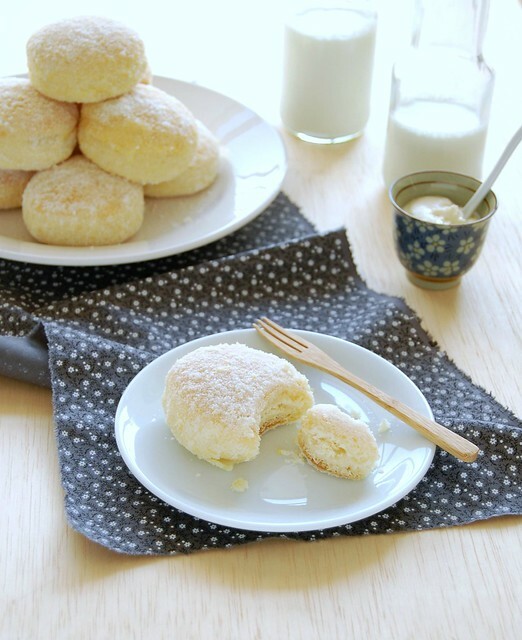 I recently made cookie with ricotta, and fell in love with the texture.Ricotta in doughnuts seems like the ingredient to render them tender! Mel, I don't think cream cheese would be soft enough. But can't say for sure. You would have to test it. omg these look so plump and fluffy.. I want them now!! These look so incredibly light and fluffy, Patricia! Would never have guessed they were out of the oven, and not the deep fryer! Like you, I hate to fry food. It makes me smell, and the house just absorbs it. Yuck. So I'm all about these! Just bookmarked the recipe. Making these AS WE TYPE! I accidentally forgot to but the egg in the filling until after I did about half of them. Whoopsie doodle! We'll see how they turn out. They look nice! Liz, I hope they turn out great for you! Love your blog!! Would you please tell me how many cups of ricotta I should use? I love all of your recipes, and wish you would include both the grams and the cups and teaspoon equivalent measurements in all of your recipes. Would you please e-mail the ricotta amount in cups and any other item that does not have the US equivalent??? I would be so happy to make these for the holidays! Thank you in advance and best regards- I look forward to your blog for the holidays. Please e-mail me at g.lia99@yahoo.com asap. Thank you!